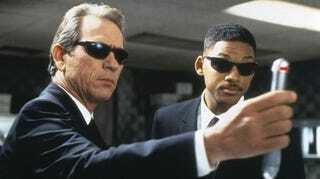 Is Men In Black 3 halfway through filming without a script? Reports from the Men In Black 3 set all seem to indicate one thing, this new time-traveling prequel/sequel is in trouble. The picture started shooting without a script in place, and now seems to be on permanent hiatus. What's happening? Worried that the NYC's filming tax breaks would get canceled at the end of 2010, the production started in November shooting the only part they had done, some of the present-day NYC shtick. After a short two months of filming, the studio put the whole crew on hiatus so the screenwriters could finish the script for the 1960s sequences. But now that hiatus has been extended all the way until March 28th, and writer David Koepp has been hired to "work out complex script issues involving time travel." Allegedly the delay is costing everyone millions, and the hiatus could kill the casts momentum for the project, but the studio protests that the NYC tax breaks (which did NOT vanish in the year 2011) will offset all over-spending. "He's become very enamored with aspects of screenwriting," said a source involved with the production. The source believed Smith has earned the right to weigh in on the script, but he says the actor's process "takes a long time." Others claim the copious time traveling scenes are a bit of a mess (hence bringing in the new writer to help Etan Cohen of Tropic Thunder fame). Plus, there's the whole issue of the director Barry Sonnenfeld and producer Walter Parkes supposedly not getting along, to the point that neither creator speaks to the other. But we're still not sure just how much of this is set gossip, at this point. The real issue here, though, is this. Unless MIB3 can pull off an amazing script that can mesh with the footage that was already shot in NYC, this feature has the potential to be a disjointed mess. It's amazing that they'd go ahead with shooting the movie with only a small portion of the screenplay agreed upon. Especially since so much of MIB can be shot on a studio (inside MIB headquarters). While we love it when ever anyone spends the time to shoot on location, this decision may lead to the Men In Black being wiped out of our memories, forever.